While the exact causes of fibroids are still unknown, there are some risk factors for their development that have been identified with the main one being an estrogen dominant state. The female hormone estrogen is important but when there are excessive amounts of this hormone in your body, it can lead to problems including the development of fibroids. If estrogen dominance is at the root of your fibroids (and your doctor can conduct tests to determine if this is the case), implementing strategies that promote hormone balance will do you a world of good not only to shrink fibroids but also to prevent them from developing or returning. Some of the ways to promote hormone balance is by eating certain amazing foods that shrink fibroids naturally because they prevent a state of estrogen dominance. One of the top foods recommended for promoting not only hormone balance but general health and well-being is flaxseed. Before cotton became affordable and easily available to the masses, flax (Linum usitatissimum) which is also known as linseed and has a fibrous stem was woven into cloth and it is still used in this same manner today despite the popularity of cotton. When looking for foods that shrink fibroids naturally, flaxseed is one of the top recommendations because it promotes hormone balance. Fibroids feed upon estrogen and excessive estrogen will allow the fibroid tumors to increase in size as well as worsen the various symptoms of uterine fibroids. Flaxseed is important for promoting hormone balance which can help shrink fibroids in the following important ways. Flaxseed is the richest source of lignans found in nature. While other plants contain lignans, none of them come close to the amount found in flaxseed. The closest competitor is sesame seeds but flaxseed has 7 times more lignans than sesame seeds! One of the main benefits of lignans is that they are very powerful antioxidants which are crucial for preventing the damaging effects of free radicals in the body. Free radicals are unstable oxygen molecules which “steal” certain particles from healthy cells in order to “heal” themselves but this only ends up creating more free radicals as the healthy cells are damaged. The effect of free radicals on the body is very damaging including increasing the risk of developing various chronic diseases and conditions such as cancer tumors. Lignans are also crucial for promoting hormone balance and preventing estrogen because they contain phystoestrogens which are a type of estrogen but from a plant source. These phytoestogens are chemically weaker than the estrogen produced naturally by the body but can still mimic the action of the estrogen produced by the body. Even though phytoestrogens are chemically weaker than the estrogen produced by the body, they can still bind themselves to estrogen receptors in the body and this helps to stop the effects on the body of the much stronger estrogen produced by the body which then allows excessive amounts of this much stronger estrogen to be eliminated from the body which prevents a state of estrogen dominance. By replacing the much stronger estrogen with the much weaker phytoestrogens, hormone balance can result and this can help shrink fibroids which is why flaxseed is one of the best foods that shrink fibroids naturally. ALA is a type of essential fatty acid (EFA) found in flaxseed that is crucial for promoting general health and well-being and preventing the risk of developing various chronic diseases. These omega-3 fatty acids found in flaxseed not only prevent the risk of chronic diseases but they are also crucial for promoting hormone balance and relieving symptoms of uterine fibroids. By helping prevent estrogen dominance, ALA can lead to fibroids shrinking naturally. Flaxseed is a rich source of a certain type of soluble fiber which is beneficial for the body which is known as mucilage. This mucilage is tied to the cholesterol lowering properties of flaxseed as well as diabetes and weight management. This soluble fiber can also help to promote hormone balance because fiber is necessary in the body for not only removing waste and toxins but also helping to eliminate excessive amounts of estrogen which can help to promote hormone balance when the excessive amounts of this female hormone are removed from the body in a timely manner. Flaxseed oil is derived from the seeds and while this oil is popular, you may want to leave this on the shelf if you have fibroids and want to get all the benefits of using flaxseed. This is because when you use flaxseed oil, you will not get the all important fiber and while the oil may contain some health properties, most of the lignans, protein and minerals are found in the actual seeds and not in the oil. Since you need fiber to help eliminate excessive amounts of estrogen, you should pass on the oil and reach for the seeds instead. Flaxseed oil is also easily perishable and must be stored in the refrigerator once opened. Flaxseed comes in two varieties i.e. 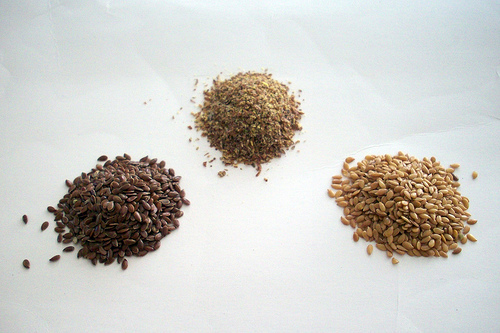 brown flax and golden flax (also known as yellow flax) which generally have similar nutritional compositions. While some people love to sprinkle whole flaxseed on salads or freshly baked bread, the body doesn’t have a mechanism to process whole flaxseeds. They will simply pass through your body undigested which means that you will not get the full benefits of flaxseed including soluble fiber. This is why flaxseed must be processed but the ground flaxseed turns rancid very quickly so you will need to store it in the refrigerator but you will need to discard any unused portion after 30 days or so. While you can easily find ground flaxseed at grocery stores, it is not as fresh as freshly ground flaxseeds so think about investing in a cheap spice or coffee grinder or other seed grinding tool so that you can grind two tablespoons or more of whole flaxseed and have it fresh to use each day to add to smoothies, oatmeal, sprinkled on hot or cold cereal, to sprinkle on salads, etc. While ground flaxseed (flaxseed meal) does not last more than 30 days or so when stored in the refrigerator, whole flaxseed can last for about 6 to 12 months or 1 to 2 years if the whole seeds are stored in the refrigerator. This is a generally safe seed which is why it is one of the top recommended foods that shrink fibroids naturally but it does contain a minute amount of cyanide which is not enough to harm an adult but could possibly harm a fetus or infant so avoid flaxseed if you are pregnant or nursing and do not give it to children under the age of two. The minute amount of cyanide in flaxseed should not be harmful to most people if you only consume the recommended daily amount which is about 2 to 3 tablespoons of ground flaxseed. It’s also important to remember that there are usually very small amounts of cyanide that are constantly present in human tissue which are constantly being metabolized so the cyanide in flaxseed should not really be a cause for alarm. In addition, other plants that are commonly eaten such as cruciferous vegetables also contain small amounts of cyanide. A tablespoon of flaxseed contains about 5 to 6 milligrams of cyanide but for cyanide to cause harm in an adult, it would have to be consumed in amounts of at least 1,000 milligrams. Other precautions with flaxseed relate to allergic reactions. Some people may be allergic to flaxseed and if so, stop using it or reduce the dose. Some people when they initially start using flaxseed may experience bloating and flatulence when. If this occurs, start with small amounts and gradually build up. If you have fibroids and are looking for the best foods that shrink fibroids naturally by preventing estrogen dominance, you need to add flaxseed to your diet but it only works effectively when used in combination with a balanced diet. For more on the best foods to eat and those to avoid in order to shrink fibroids naturally as well as other effective naturally methods to shrink and prevent fibroids, you need the Fibroids Miracle guide. Find out more about this scientifically proven holistic guide here. Prev Top 10 Natural Ways To Shrink Uterine Fibroids That You Must Try NOW!